It's Oscar weekend! I know some don't care, and some really don't care about the Oscars anymore, but it's that time of year to see what a bunch of old white guys tell us what the best films of the year are. 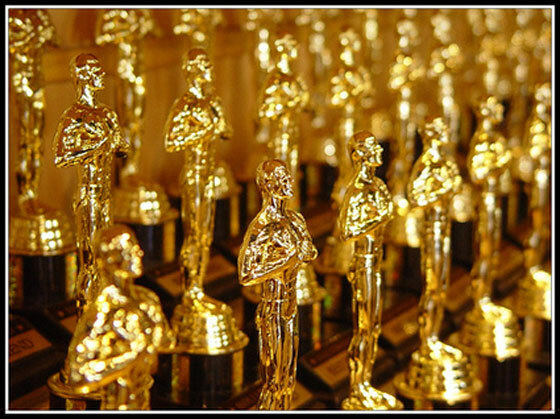 What's sad is the Oscars have almost become too predictable and pretty much boring. Maybe it was my young age, but I remember a time when there was actual excitement and anticipation of who would go home with the gold man. Nowadays, you don't even need to see the movies to figure out who the winners will be. Everyone has been throwing out their picks that they'd write down on their Oscar ballot, so I thought I would do the same. Now I have two different picks for each category. The first is what my heart wants, and the second is what I would bet on if this were a Blackjack game in Vegas. The Academy Awards airs tomorrow at 7pm on ABC. What will win: THE ARTIST because The Academy loves nostalgia. Who will win: Viola Davis, who I do love, but not necessarily for this film. Who I want: Andy Serkis, can we have a write in vote? Who I want: Not really anyone, but I guess Melissa McCarthy just because it would be funny. Who will win: Octavia Spencer, but I'm tired of people winning for stereotypical characters. Who will win: This could be close, but more than likely Michel Hazanavicius will win. Who will win: Part of me wants THE DESCENDANTS because Jim Rash from Community is a writer, but HUGO will probably win this. Who will win: RANGO. This really shouldn't even be close. Who will win: A SEPARATION. Other than BULLHEAD, I haven't heard much about any other nominees. Who will win: I would say John Williams for WAR HORSE, but he might split votes with himself. Depending on how much momentum it has, Ludovic Bource could take it. Who will win: Bret McKenzie, I don't think this is even a question. What I want: HARRY POTTER!!!!!!! But realisticly, HUGO. Who will win: Proably THE ARTIST. Who will win: I'm going out on a limb and saying Emmanuel Lubezki to shake things up a bit. Who I think: Lisy Christl. Never underestimate an Elizabethean era film. Depending on momentum, who could win: Mark Bridges. Who will win: No earthly idea. I didn't keep up as well with documentaries this year. Who I want: GOD IS THE BIGGER ELVIS because I like that title. Who will win: Again, missed these when they were playing at a local theatre, so I'm lost. Who I want: HUGO. Beginning to see a pattern here? Who I want: HARRY POTTER!!!! Who will win: THE IRON LADY? Hard say because I alwasy thought it was more about achievement in makeup, and making an actress look plain doesn't seem lke much of an achievement to me. Who I want: THE FANTASTIC FLYING BOOKS OF MR. MORRIS LESSMORE. We were able to catch these last weekend, and this short was absolutely brilliant. Who will win: LA LUNA. It's a Pixar short. I mean clearly they have to win something every year. Don't get me wrong, the short is great, but my pick went to a deeper level. Who will win: I missed these as well, so it's all up in the air. Who will win: WAR HORSE for the WWI trench sequence. Who I want: RISE OF THE PLANET OF THE APES! This shouldn't even be a question in anyones mind.